Plastic surgeons at Maastricht UMC+ have used a robotic device to surgically treat lymphedema in a patient. According to the University Medical Centre it’s the world’s first super-microsurgical intervention with ‘robot hands’. The surgeons used the robotic device earlier in September to suture vessels of 0.3 to 0.8 millimeter in the arm of the patient. 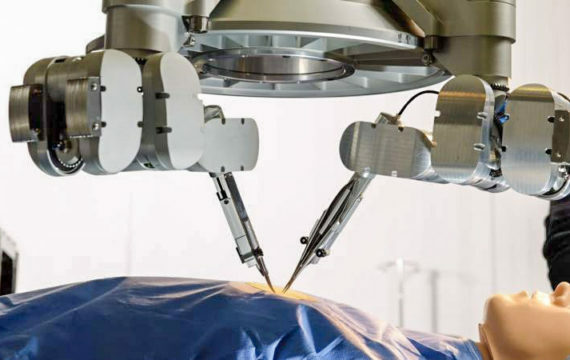 The robotic device, created by Eindhoven company Microsure, enhances the surgeon’s precision, making this type of procedure easier to perform. The patient is doing well and the surgeons are enthusiastic. The news of this extraordinary operation was announced on 27 September, at the 26th World Congress of Lymphology, in Barcelona. Lymphedema is a chronic condition in which fluid builds up and causes swelling. This serious disorder commonly occurs as a side effect of breast cancer treatment. A relatively new and potentially much better treatment for lymphedema is a super-microsurgery in which lymphatic vessels are connected to blood vessels to restore the flow of lymphatic fluid and alleviate the swelling. This intervention is, however, particularly difficult and stressful to perform given the extreme precision required from the surgeon. Worldwide, only a few surgeons are capable of carrying out this surgical technique by hand. Surgeons in Maastricht found the solution in Eindhoven, a digital innovation hub. The surgical robot of Microsure, a spin-off of Eindhoven University of Technology and Maastricht UMC+, is controlled by a surgeon whose hand movements are converted into smaller, more precise movements which then are performed on the patient by a set of ‘robot hands’. The device also stabilizes any tremor in the surgeon’s movements, which makes the procedure more controlled and thus easier to perform. The Microsure robot is expected to enhance a large number of microsurgical procedures and enable new interventions that are currently impossible to perform by hand. This will lead to better patient outcome and lower healthcare costs due to a reduced rate of complication and less post-operative treatment.